Over the past eight weeks, the members of Cherry Hill High School East’s a cappella group, Stay Tuned have become national stars. The group appeared on a new Lifetime reality television show entitled “Pitch Slapped.” The eight episode first season of the program detailed Stay Tuned and another high school group, Highland Voices from Northern Highlands Regional High School, as they competed against each other at a variety of competitions in the late spring and early summer of 2015. The season finale of the show aired on Feb. 23. While it was exciting for the students to see the show on television, some of them feel some the full story of the group still hasn’t been told. Stay Tuned is a fairly new a cappella group, having only been formed in the 2012–13 school year. 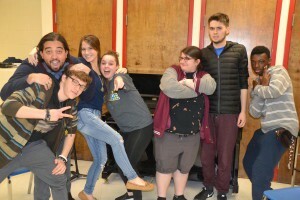 Cherry Hill East music teacher Heather Lockart formed the group through a combination of the school’s male and female a cappella groups three years ago. In just a few years, Stay Tuned became one of the best competitive a cappella groups in New Jersey. Their reputation and the competitive nature of a cappella in New Jersey prompted Lifetime producers to begin contacting Lockart. After speaking with producers, Lockart talked to the students and parents about applying. After the students expressed a ton of excitement about the project, she applied. Early last year, Lockart found out Stay Tuned would be chosen for the show along with Highland Voices. She tried to surprise her students with the news. The students in the 21-member group were ecstatic upon hearing the news. In “Pitch Slapped,” Stay Tuned would go head-to-head with Highland Voices over the course of eight episodes, with the two groups competing in a final summer invitational competition in the finale. Each school was paired with a mentor. Stay Tuned’s coach was Deke Sharon, described as the “father of contemporary a cappella” by Lockart. Sharon’s work with Stay Tuned was the highlight of the show for most of the students. Tremper felt the most important thing the group learned from Sharon was how to impact the audience through singing. Stay Tuned had an impact on numerous people during filming. In the third episode, the group sang “Beneath Your Beautiful” from Labrinth featuring Emeli Sande. A week later, the group heard how much their song touched one particular girl. Stay Tuned spent another day singing for people at a homeless shelter. It was a moment Kramer said she’d remember for a long time. After the season finale of “Pitch Slapped” aired, a number of members felt the show didn’t accurately portray the group. Stay Tuned entered the show as a frequent second-place finisher to Highland Voices. Stay Tuned was portrayed throughout the show as an underdog, a role senior Sam Waldman felt slighted by. The group also transformed a lot as the show progressed. Waldman felt there was a lot of change people didn’t see in the episodes. Tremper said the team grew a lot tighter during the show, something he felt the episodes didn’t portray well. Another storyline not touched on during the show was the growing friendship between Stay Tuned and Highland Voices. Prior to the show, the two groups had a serious rivalry between each other. That rivalry cooled completely during filming. Stay Tuned and Highland Voices have not competed against each other since the show was filmed. However, that will change as the two will face off again later in March. More than half of the members of Stay Tuned from the show graduated from Cherry Hill East in 2015. However, the members who remain say this year’s group has improved thanks to its experience on the show. Lockart said last year’s experience has had a marked impression on her returning students. Stay Tuned has gained notoriety thanks to its television appearance. A number of the group members have received a positive response from the community. Stay Tuned is now making its way through the International Championship of High School a cappella stages. The group competed in the regional quarterfinals in January and finished in the top-three, allowing them to advance to the semifinals. On March 19, they will travel to Northern Highlands Regional High School for the semis, where they will compete against a number of schools, including Highland Voices. The group has a number of big stage performances coming up as well. The day after the ICHSA semifinals, Stay Tuned will perform at Carnegie Hall as they perform in an a cappella concert by their old mentor Sharon. The next week, on March 26, the group will take the stage at the Kimmel Center as a guest at an International Championship of Collegiate A Cappella competition. Despite the busy schedule, none of the students believe it’s too much. In fact, they feel there’s no such thing as too much a cappella. Those who missed seeing Stay Tuned on “Pitch Slapped” can watch the entire first season on demand atwww.mylifetime.com.